Tesh posted a great recap of where he's coming from when he talks about MMOs and it inspired me to do the same. I don't know how interesting this will be for other people, but I'm hoping it will give you some perspective on my MMO history. The main thing you should know about me is that I love the idea of MMOs, but when I go to play them they rarely stick. There have been some exceptions, but in most MMOs I only dabble before moving on. 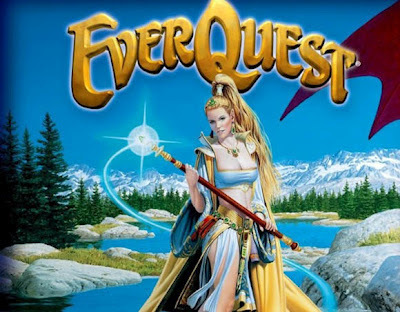 My first MMO was Everquest. My friends and I played this in middle school when it first came out. I can still remember most of the details of Crushbone, one of the first zones in the game. It's crazy that in my mind's eye I can see all of the hills, catacombs, the castle, the different routes through the zone, and I still remember the spawns. It must be because I played the game so much, but never truly leveled very high. I played from around launch in March of 1999 through the first 2 expansions. I remember how monumental those expansions were. Today, expansions are basically expected, but back then it was utterly amazing to have access to new continents, zones, and levels. The Ruins of Kunark came out in early 2000 while The Scars of Velious came out later that same year. They both kept me entertained for quite a while. After that I started high school and MMOs held less sway. They faded into the background as I moved on to different activities. When my friend got hooked on Dark Age of Camelot in 2001 I gave that a try, but only played it for a few weeks. It just never clicked with me. The same thing happened in 2003 with Shadowbane, a game that promised player run cities and sieges. It sounded fun, but again, it simply didn't hook me. That same year I enjoyed Planetside, but my computer never ran it quite right, so I had to give up on that game too. Then 2004 happened. That's the year World of Warcraft was released. WoW immediately grabbed the attention of my group of friends because we were huge WarCraft fans. I had played WarCraft 2, WarCraft 3, and all the expansion packs that went with them. Any game set in the same universe was an instant purchase. Vanilla WoW held my attention until endgame. I don't know how many months I played, but I started at launch and worked my way up to max level. I tried a raid or two, realized it wasn't for me, and retired my subscription until late 2008 when Wrath of the Lich King released and my friends convinced me to resubscribe. They then proceeded to power level me through The Burning Crusade content so that I could play Wrath with them. Once again I reached max level, tried a few raids, and promptly unsubscribed. When I went back and played through Cataclysm the same pattern emerged. You can actually go read my posts about Cataclysm from my archive to see my progression if you're interested. Along the way from Everquest to now (and my current zero MMOs) I've tried out Tabula Rasa, Star Wars Galaxies, Puzzle Pirates, Dungeons and Dragons Online, Anarchy Online, EVE Online, Final Fantasy XI, Runescape, Travian, Everquest II, Guild Wars, and probably some others that I've forgotten. I guess the moral of the story is that I've tried my fair share of MMOs, but it takes a lot to keep me interested. I'm the same way. I've played so many mmos but none of them really hooked me. Interesting fact, I've never had a max level character in any mmo. That said, I wound up with two max level characters in STO almost accidentally. I just kept playing, doing whatever struck my fancy, and soon enough, they were maxxed. I think what made that work is one, a much quicker level curve from most MMOs, and two, that I always had entertaining stuff to do; I never had to grind to qualify for more content. I wound up with a capped character in WoW a few months back, just because I wanted to play through the storylines. Getting to the cap didn't do anything for me, though; that's not why I play. Still... the way I nibble at most games and my very casual schedule don't tend to lend themselves well to capping. I've certainly spent more hours nibbling at the start of many diverse MMOs than I have spent in any one game. ...well, maybe Puzzle Pirates wins; I've played that one off and on for 6+ years. I love story in games. Once progression and story run out I just can't seem to stay excited about an MMO. At the moment I'm eyeing up GW2, I don't know how long it will stick but since it doesn't have a subscription fee I can play it whenever I want. That's a huge plus in it's favor.